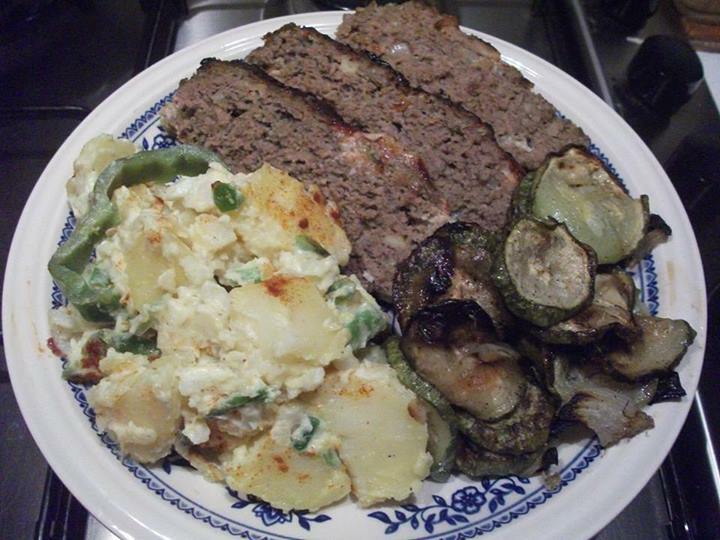 Today I made the meat loaf following a Food Network recipe. Put 1kg minced beef in a big bowl,add 1 medium onion finely chopped,4 cloves garlic minced,1 teaspoon coriander,salt and pepper,2 tablespoon brown sauce ,1 tablespoon mustard . In a bowl take 4 slices bread and pour 1/2 cup milk and rub with your fingers until its mushy. Add it to the meat mixture,2 beaten eggs and mix well. Best I find is with my hands. Form into a loaf and put in a dish lined with baking paper . On top put some ketchup that you mix with some sweet paprika and spread it on and sprinkle some oregano on top. Bake in preheated 180C oven for about 40 mins .Let it cool a bit before slicing. This entry was posted in Beef, Recipes. Bookmark the permalink.